YES – rice is good and safe for your cat when fed in moderate proportions! However, make sure it is well-cooked before you feed it to your kitty, especially if it has never tasted rice in the past. Rice is one of the most critical sources of carbohydrate and starch and will give them the energy to stay active. All rice (including black or brown, and the scented long-grain varieties like ‘basmati’ or ‘jasmine’) are easy for cats to digest. It is also a rich source of fiber and starch that would aid in digestion and ensure smooth bowel movements in both adult cats and kittens. Rice is gluten-free and furthermore assists your cat’s stomach to metabolize the food thoroughly. 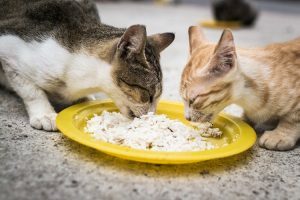 Some veterinarians and feline experts advise cat owners to feed their cat boiled rice if they suffer from an upset stomach, diarrhea or similar conditions. As mentioned, only uncooked rice can be harmful to your cat. Cats are not birds, and their stomach is not naturally modeled to be able to digest raw rice grains. If consumed, it might result in mild to severe stomach pain, bloating, and eventual constipation. Also, the raw grains may contain a natural pesticide called ‘lectin’ (used by the plant as a self-defense mechanism to paralyze small insects and pests), which might prove to be toxic if your cat happens to ingest large quantities of uncooked rice. Finally, like dogs, cats need ‘taurine’. Taurine (or ‘2-aminoethanesulfonic acid’) is an essential substance that is distributed widely in the tissues of animals, and rice lacks this organic compound. Before boiling the rice, make sure you wash the grains thoroughly and repeatedly as long as the drained water doesn’t look clear, removing the excess dirt. It is recommended that you pick up only organic rice packets from the store. Do not serve them cold or refrigerated rice, but it should be fresh and hot. For a wholesome, nutritious diet, you can serve rice along with boiled chicken or fish, or can even sprinkle rice on cat food. Puffed rice or granola bars (that contains dry puffed rice) are not harmful to cats, but plain rice is always the best option. Avoid the spicy rice recipes like fried rice, coconut rice, yellow rice, and Mexican rice, since they contain spices and seasonings that may not be good for your kitty’s stomach. Serving brown rice is the best way to help your cat derive maximum nutrition from it though white rice is easier to digest. Never mix anything with rice (dairy products like milk or curd, different kinds of beans/corns/peas, or fish like tuna) unless you are sure that the ingredient is completely safe for your feline friend. When preparing your feline’s food, ensure that approximately 75% of the ingredients comprise of meat products, while rice makes up for about 25%, with some nutritious vegetables also being sprinkled. Keep this in mind while buying food for your cat and make sure that rice or other grains do not exceed the protein percentage. Published on December 29th 2017 by admin under . Article was last reviewed on 29th December 2017.